Ketchup hecho en casa (Homemade Ketchup) - Tienditadepuertorico.com - Buy Puertorican Food Here!! Cook over moderately low heat, stirring occasionally, until softened, about 7 minutes. Add brown sugar, paprika, allspice and cloves. Cook, stirring occasionally, until sugar melts. Add vinegar and tomato paste. Cook over moderate heat until thick, about 3 minutes. until very thick, 15 to 20 minutes. 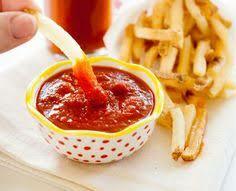 Transfer ketchup to blender or food processor and puree until smooth.